Elizabeth Williams's sketch from the trial of Chevron v Donzinger, a civil case that involved the polluting of the Amazon River in Ecuador by Texaco. 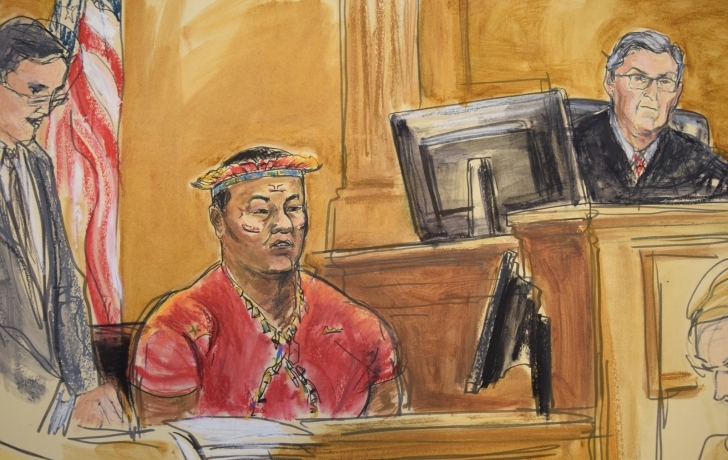 An Amazonian tribal leader testified in his native garb. With cameras forbidden in federal trials, the courtroom artist is our visual link to the defendants, lawyers, judges and witnesses who are the characters in some of the biggest legal dramas of our times. Now we can view that art—as art—in a show coming to the main lobby of the Moynihan U.S. Courthouse at 500 Pearl Street. “History Through Art: An Exhibition of 35 Years of Courtroom Art” opens on Oct. 4. and features 118 pieces, the work of three veteran courtroom sketch artists: Liz Williams, Jane Rosenberg and Aggie Kenny. The show is sponsored by the Bench and Bar of the United District Court for the Southern District of New York. The exhibit is open to the public during the court’s business hours, 8:30 a.m. to 5 p.m., Monday through Friday.